MAKE THE DOUGH In a food processor, pulse the flour with the salt. Add the butter and pulse until the mixture resembles coarse meal. Drizzle on the ice water and pulse until the dough just comes together. Turn the dough out onto a work surface, gather any crumbs and pat the dough into a disk. Wrap in plastic and refrigerate until well chilled, about 1 hour. On a lightly floured work surface, roll out the dough to a 13-inch round. Ease the dough into a 9-by 2-inch ceramic or glass pie plate. Fold the overhang underneath, press the edges together gently, then crimp decoratively. Prick the bottom of the dough in several places with a fork. Refrigerate until firm, about 30 minutes. Preheat the oven to 375°. Line the pastry with parchment paper and fill with pie weights. Bake for 20 minutes, until pale golden. Remove the parchment and pie weights. Bake for 15 to 20 minutes, until lightly browned. Let cool on a rack. Increase the oven temperature to 425°. MAKE THE FILLING On a large rimmed baking sheet, toss the yams with the olive oil and season with salt and pepper. Roast in the oven for about 20 minutes, stirring once, until browned and tender. Let cool. Leave the oven on and reduce the temperature to 375°. In a medium bowl, whisk the half-and-half with the eggs, 1 teaspoon of salt, 1/2 teaspoon of pepper and the nutmeg. In a small saucepan, melt the butter over moderate heat. Add the onion and a pinch of salt and cook, stirring occasionally, until softened, about 5 minutes. Remove the pan from the heat and stir in the sage. Set the pie plate on a foil-lined baking sheet. Pour the custard into the cooled pie shell, then sprinkle in the cheese. Top with the roasted yams and onion and bake the quiche for 45 to 50 minutes, until the filling set but the center jiggles slightly. Let cool for 20 minutes before serving. 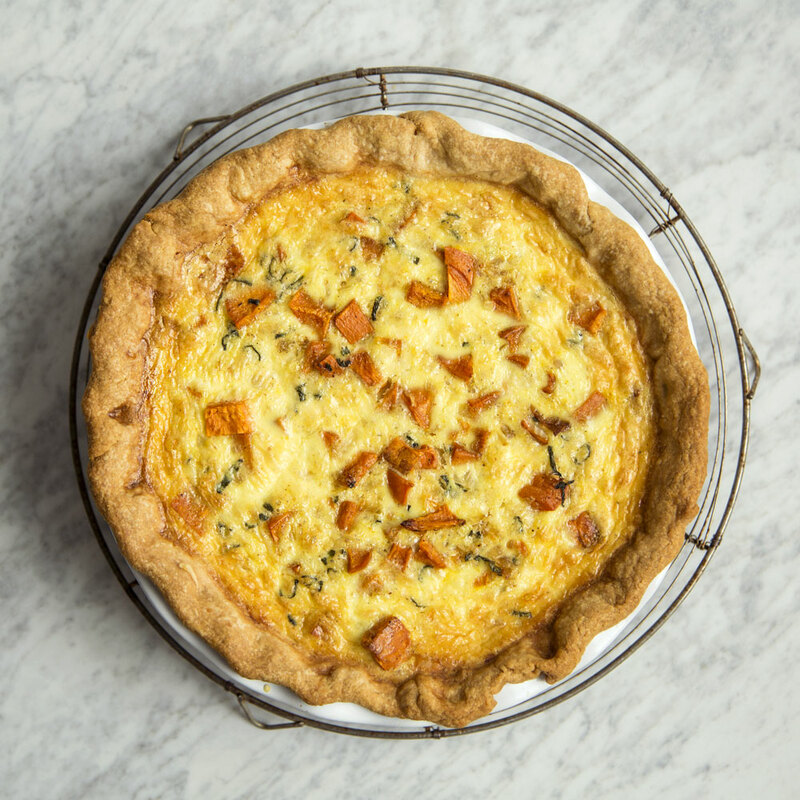 The yam quiche can be baked and refrigerated for up to 1 day. Reheat in a 350° oven for about 30 minutes, until warmed through.